Spinach and Wine: So many ways to use SMOKED BUTTER! OK I am sure you are wondering what the heck this is...WELL its cold smoked butter, think cold smoked cheeses and salmon except BUTTER! The ONLY place this is produced is in a small artisanal smokehouse on the Northern California Coast in the lovely town of El Granada and they sell LOTS of it. I have used it in LOTS of ways but, my favorite is in Parmesan Potatoes (smoked butter and smoked Parmesan), ALL veggies, fish and a nice little pat on a perfectly grilled steak is DIVINE. 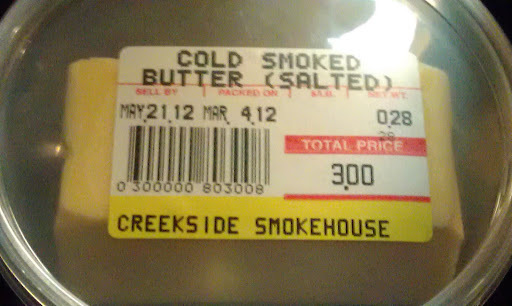 This stuff is addicting and thinking up uses for it can be mind boggling....woohoo smoked butter!